CCST is seeking PhD scientists and engineers for a year of public service and government leadership training in the California State Legislature. The California Council on Science and Technology is now accepting applications for the 2020 Class of our CCST Science & Technology Policy Fellowship. Completed applications are due by February 28th, 2019. The CCST Science Fellows program is open to those holding a PhD or equivalent degree in science and engineering, and in social science fields such as economics. Eligibility information, program timeline, and the application link can be found at ccst.us/ccst-science-fellows-program. As CCST Science Fellows, scientists and engineers spend one year in Sacramento serving the California State Legislature. Working as legislative staff in the State Assembly or State Senate, they get a front-row seat learning about the craft and process of lawmaking in the State of California — a dynamic arena that often sets policy trends for the United States and the world. Our fellowship is an incredible opportunity to transform a researcher’s professional path. In fact, more than 50 percent of CCST Science Fellows have been hired by the California State Legislature or state agencies since completing their fellowship. Other alumni return to academia, nonprofits, or industry with a deeper understanding of how science informs policymaking, enhancing their career as researchers, professors, consultants, and leaders. Read reflections from current fellows and alumni at our fellows blog (http://ccst.us/ccst-science-fellows-program/blog/). 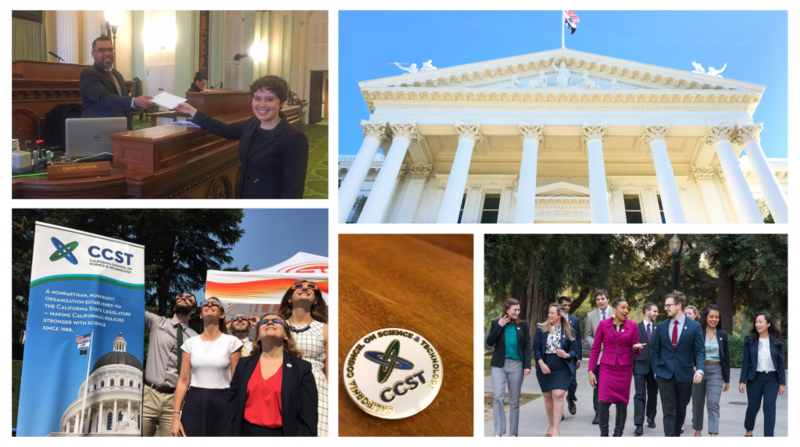 See how the CCST Science Fellows program has changed their professional path — and helped make California’s policies stronger with science! CCST is a nonpartisan, nonprofit organization established via the California State Legislature in 1988. We engage leading experts in science and technology to advise State policymakers – ensuring that California policy is strengthened and informed by scientific knowledge, research, and innovation. Discover how CCST makes California’s policies stronger with science at www.ccst.us. The CCST Science Fellows program trains scientific thinkers to be policy-savvy, while helping equip California’s lawmakers with science-savvy staff. The program was established in 2009 with funds from the Gordon and Betty Moore Foundation and other generous friends, and continues to rely on philanthropic foundations and individuals for support. Discover how our Science Fellows make a difference in California’s policy arena at fellows.ccst.us.